Biography: Melody DeFields McMillan is a teacher who lives in Simcoe, Ontario, not far from where she grew up. She is the mother of two adult children. When she's not writing, she's enjoying all that nature has to offer. 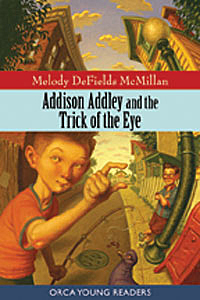 Her first book about the irrepressible Addison (Addison Addley and the Things That Aren't There) was nominated for a Silver Birch Award. Addison learns the difference between perspective and illusion.